If your marriage is struggling with negativity, arguments, blame or unpleasant personality traits (among other things), stop living in misery. Start listening now, from any device, to this online “crash course.” It helps you become lovers, not fighters! Does your marriage ever feel like a battle zone? Maybe there are open hostilities or maybe it’s more of a cold war situation. Either way, this realistic and highly usable program has the insights and strategies you need to bring peace, harmony and happiness to your marriage, especially if you’re recovering from an affair or other serious marriage problem. It used to take me months of office sessions to provide this information; however, this format allows me to do it in a matter of hours. 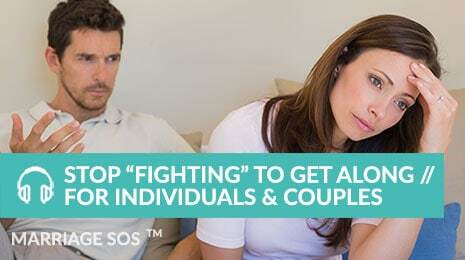 Stop “Fighting” to Get Along can help you tear down the entrenched behaviors that have been sucking the life and love out of your marriage, and rebuild your marriage on the foundation of a romantic friendship. One filled with affection, comfort and happy stability for you, your spouse and your family. The usable insights and practical strategies in this course can help you make it happen. I designed this program to appeal to even the most defensive of people – its content and convenient, non-confrontational delivery can help challenging personality types remain open-minded and willing to look at themselves. In fact, this may be the only way some people can be reached. But even if your partner won’t participate, take heart. You have the power to create huge changes on your own. This online program can show you how to take the first steps toward a happier marriage and home life. This crash course is versatile – you can take it together, as a couple, perhaps taking turns listening to it and working through the content. Alternatively, you can take it alone if your spouse isn’t ready or willing to participate. You can lead the way. Don’t stay stuck in misery or conflict! Move forward, even if you have to take those first steps alone. Chances are, your partner will notice the difference and will like it. Many marriage problems get worse, or lead to divorce, because people hesitate to get help, are too passive, or don’t know what to do when their spouse won’t participate. This online course is perfect for people who are looking for a more proactive, assertive way to deal with the challenges they are facing in their marriage.